The purpose of the Highway Safety Manual (HSM) is to provide the best factual information and proven analysis tools for crash frequency prediction. The HSM will facilitate integrating quantitative crash frequency and severity performance measures into roadway planning, design, operations, and maintenance decisions. The primary focus of the HSM is the increased application of analytical tools for assessing the safety impacts of transportation project and program decisions. Identify sites with the most potential for crash frequency or severity reduction. 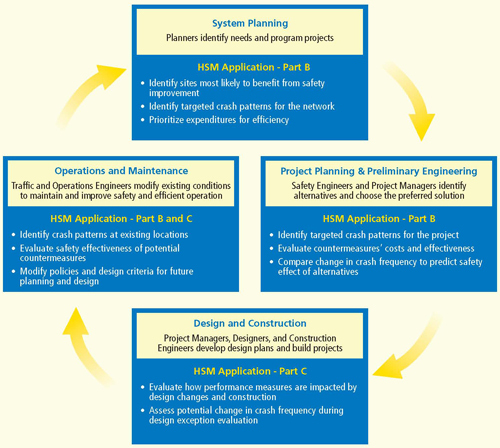 How does the HSM apply to the Project Development Process? What about tort liability and risk management? The HSM is designed to support practitioners in managing risk. The quantitative analysis of safety data provides protection to public agencies concerned about risk. The HSM is neither intended to be, nor does it establish, a legal standard of care for users or professionals. No standard of conduct or any duty toward the public or any person shall be created or imposed by the publication and use or nonuse of the HSM. Documentation used, developed, compiled or collected for analyses conducted in connection with the HSM may be protected under Federal law (23 USC 409). What training is available to assist me in using the HSM? Step by step procedures with examples are included in the HSM to assist practitioners. Additionally, training courses are available through the National Highway Institute at http://nhi.fhwa.dot.gov. How much does it cost? Can I buy it online? The HSM is currently available for purchase from AASHTO for $325 for AASHTO members and $390 for non-members. Discounts are available for those states taking HSM training. Both hard copy and electronic versions are available. To purchase, visit https://bookstore.transportation.org and search under code HSM-1.